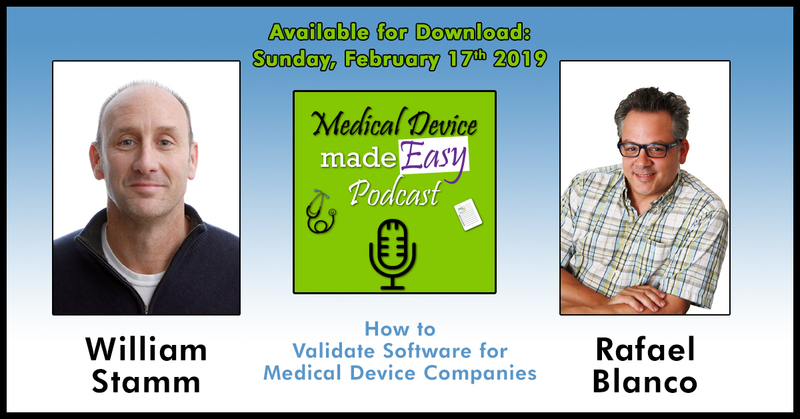 On Wednesday, January 23, our Software Services VP Bill Stamm and Director of IV&V Rafael Blanco recorded a podcast about how to validate software for medical device companies. The podcast was released on Sunday, February 17, on the Easy Medical Device Web site. Operated by Monir El Azzouzi, Easy Medical Device’s goal is to create a community of like-minded people who can help each other learn about all aspects of medical device regulations and standards. And then take that knowledge to serve their own medical community. To that end, Monir educates himself and others by blogging, making podcasts and videos, and interacting with the medical community on a regular basis. Mr. Stamm is the Vice President of Software Services at General Digital Corporation. He leads the Software Services team in sales and business management, growing global customer relations and partnerships, and oversees all software development, certification, IV&V testing and documentation. Mr. Stamm joined General Digital in 2015. With over 25 years of experience in the field, his varied background has brought him from service and engineering into sales and marketing. Mr. Stamm has also owned several businesses and has worked as an international sales and marketing manager at various other technology companies, such as EMC and Practical Automation. Mr. Stamm holds degrees in Computer Engineering, as well as Business Administration and Management. Mr. Blanco has extensive experience with Software Verification and Validation of Avionics systems and components. He has performed verification (integration testing, module testing, reviews) on Bleed Air Systems, Mechanical Actuators, Fuel Pumps, Fuel Tanks & Systems, Automatic Flight Control Systems, Engine Controls, Starters, Pneumatic Systems Equipment, Cooling Systems, Fly-by-Wire Systems and Flight Management Systems. With over 25 years of experience in testing and project management, he has successfully brought his customers through FAA (Transport Canada, JAA) certifications for DO-178 projects both as a Verification Engineer and a Project Manager. The General Digital Software Services business unit has over 45 years of extensive software development, certification and testing expertise—including Independent Validation & Verification (IV&V)—in the most stringent safety critical environments in the world: medical (FDA, IEC62304, PMAs and 510(k)), industrial controls (IEC 61508, IEC 61131), aerospace & avionics (DO178), and pharmaceutical and general packaging and robotic equipment. Our services can encompass the full software life cycle from development to verification, or simply help with overflow work.